The iPad 2'release is widely expected recently. Apple fans are already looking forward to the possibility of a new form factor and a new screen size. The new screen size with higher resolution will help the Apple tablet reach the best visual effects. Its big screen is far superior to a smartphone for showing off videos. However, as we known, the iPad 2 plays videos only a handful of video formats. If you save some videos from YouTube, Google, Dailymotion or other online video website, FLV is the most common format which is incompatible with iPad 2, the same to iPad Pro and iPad mini 4. Then how to download video to iPad 2? In order to do this task, you need a third party program to help you. 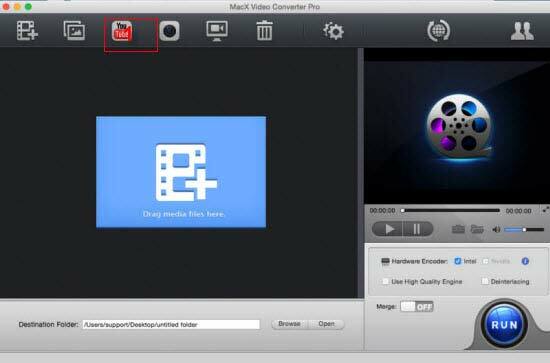 MacX Video Converter Pro can help you download video to iPad 2/iPad Pro/Mini/Air in 3 steps with World's NO.1 fast speed. World's fastest iPad video converter for Mac enables you to download any video to iPad 2/Pro/Mini 4/Air 2, etc. with 4K UHD, 1080P, 720P HD, from YouTube, FB, Vimeo, etc. 300+ video music sites in secs only. 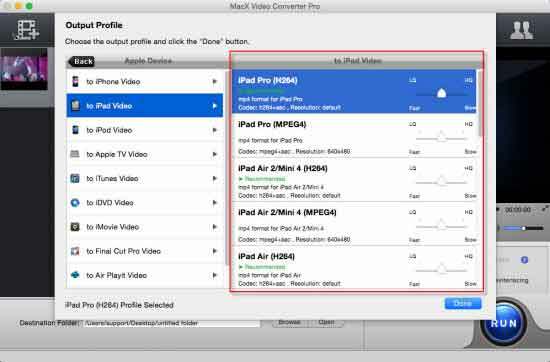 Here is a detailed guide about how to save video to iPad 2 on Mac with the fastest video converter for iPad. You can use this video to iPad 2 converter to feel free to download and watch videos on your iPad 2. Free download this fastest iPad video converter software, click "YouTube" button, copy and paste the video URL to the type box. This video to iPad converter supports downloading videos from YouTube, Dailymotion, Google video and many other video-sharing sites. Then click "OK". Choose "to iPad" as output format. There are also much more output video format to be chosen, such as MOV, MP4, YouTube, MP3. With this video to iPad converter, you can download video and convert video to iPad 2 as well as transfer the video to YouTube supported format and upload to YouTube. Then you can start conversion of video to iPad 2. When the conversion is done you can put the output video to your iPad 2 and enjoy it any time you like. Moreover, this iPad video downloader & converter can bring you with more surprises, like world's fastest speed for downloading YouTube HD videos, 4K 60fps videos, video downloading to iPhone, 1:1 lossless HD video recording, HD video compression, photo slideshow making, etc. More strengthes beyond your imagination. Here is a list of the top free Mac video converter for free converting SD and HD videos on Mac, like mkv to avi, AVI to mp4 etc, and converting video to your iPhone, iPod, iPad, etc. 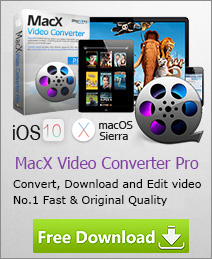 Download the fastest video converter for Mac to convert video free now. How to Download YouTube to iPad Pro on Mac/PC Effortlessly? Want to download YouTube to iPad Pro for offline watching? You just need a YouTube to iPad Pro downloader for Mac/PC to help you download/convert YouTube videos, including HD, 4k video to your new iPad Pro with expansive 12.9-inch Retina display. This is an iPad Mini 4 movies download guidance, offering solutions on how to download movies to iPad Mini 4, iPad Pro as well as transfer downloaded movies to iPad for offline playback.